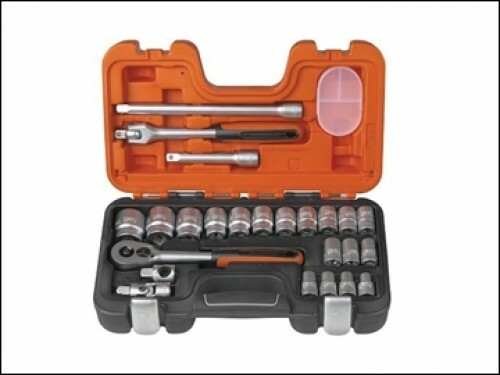 This Bacho socket set consists of 18 in square drive sockets with dynamic drive profile and includes a 54-tooth ratchet and popular accessories. Manufactured from chrome vanadium steel with a chrome-plated finish. Supplied in a polypropene plastic case, which is resistant to oil and temperature. Manufactured to DIN3120/ ISO 1174 standards. 1 each in 6-point dynamic drive sockets: 10, 11, 12, 13, 14, 15, 16, 17, 18, 19, 20, 21, 22, 23, 24, 27, 30 and 32mm. 1 each in extension bar 125mm (5 in) and 250mm (10 in). 1 x in universal joint. 1 x in flexible handle 10 in with grip. 1 x in ratchet handle 54-teeth.